The diagnosis of systemic lupus erythematosus (SLE) must be based on the proper constellation of clinical findings and laboratory evidence. Familiarity with the diagnostic criteria helps clinicians to recognize SLE and to subclassify this complex disease based on the pattern of target-organ manifestations. The 1982 American College of Rheumatology (ACR) criteria summarized features necessary to diagnose SLE. [97, 5] These criteria were last updated in 1997. [5, 6] The presence of 4 of the 11 criteria yields a sensitivity of 85% and a specificity of 95% for SLE (see Table 1). Keep in mind that individual features are variably sensitive and specific. Patients with SLE may present with any combination of clinical features and serologic evidence of lupus. In patients with high clinical suspicion and/or high ANA titers, additional testing is indicated. This commonly includes evaluation of antibodies to dsDNA, complement, and ANA subtypes such as Sm, SSA, SSB, and ribonucleoprotein (RNP) (often called the ENA panel), as well as screening anticardiolipin antibodies, lupus anticoagulant, and +/- beta-2 glycoprotein antibodies. The CBC count may help screen for leukopenia, lymphopenia, anemia, and thrombocytopenia. Urinalysis and creatinine studies may be useful to screen for kidney disease. Levels of inflammatory markers, including the ESR and CRP, may be elevated in any inflammatory condition, including SLE. However, the level of ESR elevation may show a discrepancy relative to a normal CRP level in SLE flares; if both markers are markedly elevated, suspect the presence of an infectious process. CRP levels change more acutely, and the ESR lags behind disease changes. Measurement of complement may be useful, because C3 and C4 levels are often depressed in patients with active SLE as a result of consumption by immune complex–induced inflammation. In addition, some patients have congenital complement deficiency that predisposes them to SLE. Liver test results may be mildly elevated in acute SLE or in response to therapies such as azathioprine or nonsteroidal anti-inflammatory drugs (NSAIDS). Creatine kinase levels may be elevated in myositis or overlap syndromes. ANA = antinuclear antibody; CNS = central nervous system; ds-DNA = double-stranded DNA; ELISA = enzyme-linked immunoassay; ENA = extractable nuclear antigen; Ig = immunoglobulin; p-ANCA = perinuclear antineutrophil cytoplasmic antibody; RBCs = red blood cells; RNP = ribonucleic protein; SLE = systemic lupus erythematosus; Sm = Smith; SSA = Sjögren syndrome A; SSB = Sjögren syndrome B. Joint radiography often provides little evidence of systemic lupus erythematosus (SLE), even in the presence of Jaccoud arthropathy with deformity or subluxations. The most common radiographs in SLE show periarticular osteopenia and soft-tissue swelling without erosions. Chest imaging studies include radiography (see the first image below) and computed tomography (CT) scanning (see the second image below). These modalities can be used to monitor interstitial lung disease and to assess for pneumonitis, pulmonary emboli, and alveolar hemorrhage. 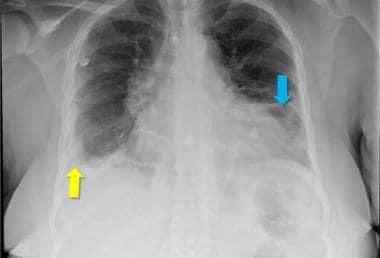 The chest x-ray from a patient with lupus demonstrates a right-sided pleural effusion (yellow arrow) and atelectasis with scarring in the left lung base (blue arrow). 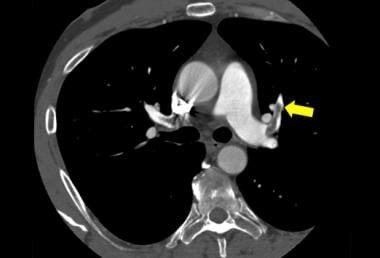 In severe complications, a fibrothorax may develop. Vasculitis, antiphospholipid antibodies, and renal failure are commonly found in patients with lupus; these conditions greatly increase the risk of developing pulmonary emboli. The diagnosis in a patient with shortness of breath, hemoptysis, and pleuritic chest pain is commonly made with ventilation-perfusion scans or computed tomography (CT) angiography. The CT angiogram demonstrates a filling defect in the left anterior segmental artery (arrow). Echocardiography is used to assess for pericardial effusion, pulmonary hypertension, or verrucous Libman-Sacks endocarditis (see the image below). Libman-Sacks endocarditis is the most characteristic cardiac manifestation of lupus. It is characterized by clusters of verrucae on the ventricular surface of the mitral valve. These lesions consist of accumulation of immune complexes, platelets, and mononuclear cells. This can lead to heart failure, valvular dysfunction, emboli, and secondary infective endocarditis. 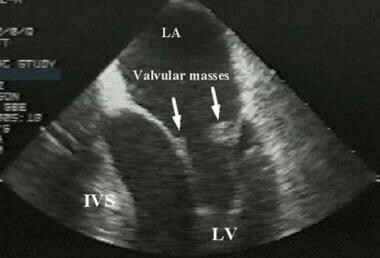 Diagnosis is best made via echocardiography, which may reveal the characteristic valvular masses (arrows). IVS = interventricular septum; LA = left atrium; LV = left ventricle. 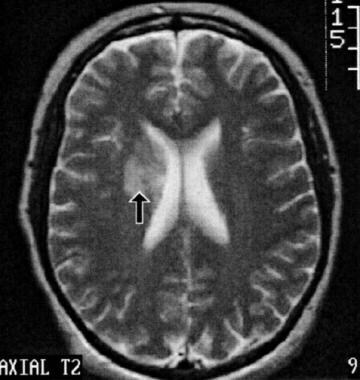 This axial, T2-weighted brain magnetic resonance image (MRI) demonstrates an area of ischemia in the right periventricular white matter of a 41-year-old woman with long-standing systemic lupus erythematosus (SLE). She presented with headache and subtle cognitive impairments but no motor deficits. Faintly increased signal intensity was also seen on T1-weighted images, with a trace of enhancement following gadolinium that is too subtle to show on reproduced images. Distribution of the abnormality is consistent with occlusion of deep penetrating branches, such as may result from local vasculopathy, with no clinical or laboratory evidence of lupus anticoagulant or anticardiolipin antibody. Cardiac embolus from covert Libman-Sacks endocarditis remains less likely due to distribution. Arthrocentesis may be performed in patients with joint effusions, which can be inflammatory or noninflammatory. The cell count may range from less than 25% polymorphonuclear neutrophils (PMNs) in noninflammatory effusions to more than 50% in inflammatory effusions. Viscosity will be high in noninflammatory effusions and low in inflammatory effusions. The gross appearance of these fluids will be straw-colored or clear in noninflammatory cases and either cloudy or yellow in inflammatory ones. Lumbar puncture may be performed to exclude infection with fever or neurologic symptoms. Nonspecific elevations in cell count and protein level and decrease in glucose level may be found in the cerebrospinal fluid of patients with central nervous system lupus. 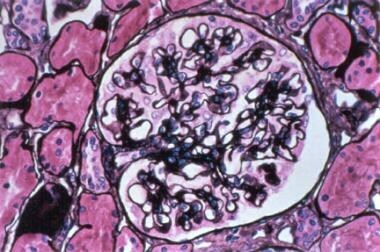 The 2012 American College of Rheumatology (ACR) guidelines for lupus nephritis recommend renal biopsy for all cases of active, previously untreated lupus nephritis, unless contraindicated. Renal biopsy is used to confirm the presence of lupus nephritis; to aid in classification of systemic lupus erythematosus (SLE) nephritis based on the International Society of Nephrology/Renal Pathology Society (ISN/RPS) classification (see Table 4, below); and to guide therapeutic decisions. Another benefit of renal biopsy is in distinguishing renal lupus from renal vein thrombosis, which may be a complication of antiphospholipid antibody syndrome and require anticoagulation rather than immunomodulatory therapy. Note: It remains to be determined whether further subcategories have a prognostic difference. There are conflicting data from studies; some investigators report that class IV-G (A) has a better prognosis relative to class IV-S (A/C), which is less responsive to treatment. SLE = systemic lupus erythematosus. 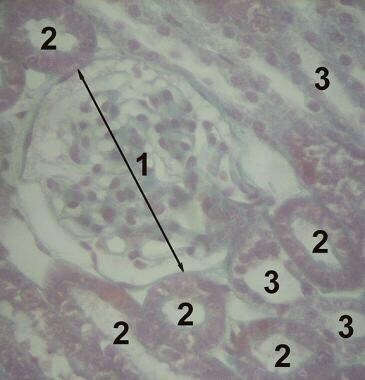 Histologic images of a normal renal cortex and of various stages of SLE are shown below. 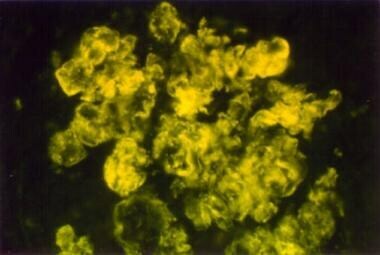 Mesangial proliferative lupus nephritis with moderate mesangial hypercellularity. International Society of Nephrology/Renal Pathology Society 2003 class II (×200, hematoxylin-eosin). Focal lupus nephritis. International Society of Nephrology/Renal Pathology Society 2003 class III (×200, immunofluorescence). 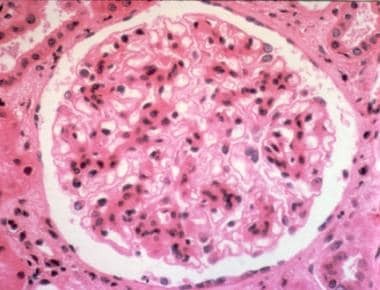 Membranous lupus nephritis showing thickened glomerular basement membrane. International Society of Nephrology/Renal Pathology Society 2003 class V (×200, silver stain). Skin biopsy can help in diagnosing SLE or unusual rashes in patients with this condition. Many different rashes may herald SLE, making review by a dermatopathologist important. Lupus skin rash often demonstrates inflammatory infiltrates at the dermoepidermal junction and vacuolar change in the basal columnar cells. Discoid lesions demonstrate more-significant skin inflammation, with hyperkeratosis, follicular plugging, edema, and mononuclear cell infiltration at the dermoepidermal junction. In many SLE rashes, immunofluorescent stains demonstrate immunoglobulin and complement deposits at the dermoepidermal basement (see the images below). Lupus band test. 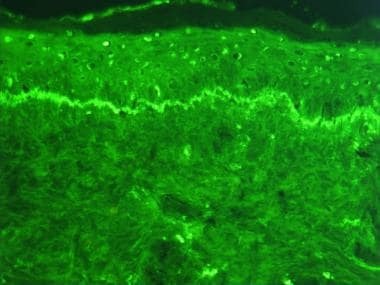 Microphotograph of a histologic section of human skin prepared for direct immunofluorescence using an anti-IgG antibody. The skin is from a patient with systemic lupus erythematosus and shows IgG deposit at 2 different places: the first is a band-like deposit along the epidermal basement membrane ("lupus band test" is positive); the second is within the nuclei of the epidermal cells (anti-nuclear antibodies). 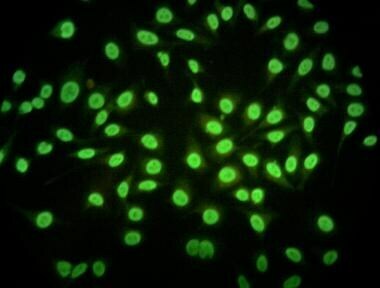 Microphotograph of a fixed Hep-2 line cell prepared for indirect immunofluorescence. The preparation was exposed to a serum of a patient with systemic lupus erythematosus and labeled using a murine anti-human immunoglobulin G (IgG) antibody. It shows IgG deposit in the nucleus and nonspecific deposit in the cytoplasm. Livingston B, Bonner A, Pope J. Differences in clinical manifestations between childhood-onset lupus and adult-onset lupus: a meta-analysis. Lupus. 2011 Nov. 20(13):1345-55. [Medline]. DUBOIS EL, TUFFANELLI DL. CLINICAL MANIFESTATIONS OF SYSTEMIC LUPUS ERYTHEMATOSUS. COMPUTER ANALYSIS OF 520 CASES. JAMA. 1964 Oct 12. 190:104-11. [Medline]. HARVEY AM, SHULMAN LE, TUMULTY PA, CONLEY CL, SCHOENRICH EH. Systemic lupus erythematosus: review of the literature and clinical analysis of 138 cases. Medicine (Baltimore). 1954 Dec. 33(4):291-437. [Medline]. Dall'Era M, Wofsy D. Clinical Manifestations of Systemic Lupus Erythematosus. Firestein GS, Budd RC, Gabriel SE, MacInnes IB, O’Dell JR, eds. Kelley and Firestein's Textbook of Rheumatology. 10th ed. Philadelphia, Pa: Elsevier Saunders; 2017. 1345-67. American College of Rheumatology. 1997 Update of the 1982 American College of Rheumatology revised criteria for classification of systemic lupus erythematosus. Available at http://tinyurl.com/1997SLEcriteria. Accessed: November 6, 2018. Bertsias G, Fanouriakis A, Boumpas DT. Treatment of Systemic Lupus Erythematosus. Firestein GS, Budd RC, Gabriel SE, MacInnes IB, O’Dell JR, eds. Kelley and Firestein's Textbook of Rheumatology. 10th ed. Philadelphia, Pa: Elsevier Saunders; 2017. 1368-88. D'Cruz DP, Khamashta MA, Hughes GR. Systemic lupus erythematosus. Lancet. 2007 Feb 17. 369(9561):587-96. [Medline]. Lupus Foundation of America. What causes lupus?. Available at https://resources.lupus.org/entry/what-causes-lupus. November 28, 2016; Accessed: November 6, 2018. Arbuckle MR, McClain MT, Rubertone MV, et al. Development of autoantibodies before the clinical onset of systemic lupus erythematosus. N Engl J Med. 2003 Oct 16. 349(16):1526-33. [Medline]. Andrade F, Casciola-Rosen L, Rosen A. Apoptosis in systemic lupus erythematosus. Clinical implications. Rheum Dis Clin North Am. 2000 May. 26(2):215-27, v. [Medline]. Crow MK. Etiology and Pathogenesis of Systemic Lupus Erythematosus. Firestein GS, Budd RC, Gabriel SE, McInnes IB, O'Dell JR, eds. Kelley and Firestein's Textbook of Rheumatology. 10th ed. Philadelphia, Pa: Elsevier Saunders; 2017. 1329-44. Munoz LE, Gaipl US, Franz S, Sheriff A, Voll RE, Kalden JR, et al. SLE--a disease of clearance deficiency?. Rheumatology (Oxford). 2005 Sep. 44(9):1101-7. [Medline]. Muñoz LE, Janko C, Grossmayer GE, et al. Remnants of secondarily necrotic cells fuel inflammation in systemic lupus erythematosus. Arthritis Rheum. 2009 Jun. 60(6):1733-42. [Medline]. Cancro MP, D'Cruz DP, Khamashta MA. The role of B lymphocyte stimulator (BLyS) in systemic lupus erythematosus. J Clin Invest. 2009 May. 119(5):1066-73. [Medline]. [Full Text]. Lo MS, Tsokos GC. T cells in systemic lupus erythematosus: progress toward targeted therapy [August 2011]. The Rheumatologist. [Full Text]. Hanly JG, Urowitz MB, Su L, et al. Autoantibodies as biomarkers for the prediction of neuropsychiatric events in systemic lupus erythematosus. Ann Rheum Dis. 2011 Oct. 70(10):1726-32. [Medline]. Bosch X. Systemic lupus erythematosus and the neutrophil. N Engl J Med. 2011 Aug 25. 365(8):758-60. [Medline]. Deng Y, Tsao BP. Genetic susceptibility to systemic lupus erythematosus in the genomic era. Nat Rev Rheumatol. 2010 Dec. 6(12):683-92. [Medline]. [Full Text]. Moser KL, Kelly JA, Lessard CJ, Harley JB. Recent insights into the genetic basis of systemic lupus erythematosus. Genes Immun. 2009 Jul. 10(5):373-9. [Medline]. [Full Text]. Tsokos GC, Kammer GM. Molecular aberrations in human systemic lupus erythematosus. Mol Med Today. 2000 Nov. 6(11):418-24. [Medline]. Teruel M, Alarcón-Riquelme ME. The genetic basis of systemic lupus erythematosus: What are the risk factors and what have we learned. J Autoimmun. 2016 Aug 10. [Medline]. Sestak AL, Fürnrohr BG, Harley JB, Merrill JT, Namjou B. The genetics of systemic lupus erythematosus and implications for targeted therapy. Ann Rheum Dis. 2011 Mar. 70 Suppl 1:i37-43. [Medline]. Hu W, Ren H. A meta-analysis of the association of IRF5 polymorphism with systemic lupus erythematosus. Int J Immunogenet. 2011 Oct. 38(5):411-7. [Medline]. Lanata CM, Chung SA, Criswell LA. DNA methylation 101: what is important to know about DNA methylation and its role in SLE risk and disease heterogeneity. Lupus Sci Med. 2018. 5 (1):e000285. [Medline]. [Full Text]. Souyris M, Cenac C, Azar P, Daviaud D, Canivet A, Grunenwald S, et al. TLR7 escapes X chromosome inactivation in immune cells. Sci Immunol. 2018 Jan 26. 3 (19):[Medline]. Arnett FC, Assassi S. Heredity and arthritis. Reviewed: February 2012. Available at http://www.rheumatology.org/practice/clinical/patients/diseases_and_conditions/heredity.pdf#search=sle. Accessed: September 25, 2015. Sanchez E, Nadig A, Richardson BC, et al. Phenotypic associations of genetic susceptibility loci in systemic lupus erythematosus. Ann Rheum Dis. 2011 Oct. 70(10):1752-7. [Medline]. Järvinen TM, Hellquist A, Zucchelli M, et al. Replication of GWAS-identified systemic lupus erythematosus susceptibility genes affirms B-cell receptor pathway signalling and strengthens the role of IRF5 in disease susceptibility in a Northern European population. Rheumatology (Oxford). 2012 Jan. 51(1):87-92. [Medline]. Blank M, Shoenfeld Y, Perl A. Cross-talk of the environment with the host genome and the immune system through endogenous retroviruses in systemic lupus erythematosus. Lupus. 2009 Nov. 18(13):1136-43. [Medline]. Tsokos GC, Magrath IT, Balow JE. Epstein-Barr virus induces normal B cell responses but defective suppressor T cell responses in patients with systemic lupus erythematosus. J Immunol. 1983 Oct. 131(4):1797-801. [Medline]. Manfredo Vieira S, Hiltensperger M, Kumar V, Zegarra-Ruiz D, Dehner C, Khan N, et al. Translocation of a gut pathobiont drives autoimmunity in mice and humans. Science. 2018 Mar 9. 359 (6380):1156-1161. [Medline]. [Full Text]. Parks CG, D'Aloisio AA, Sandler DP. Early Life Factors Associated with Adult-Onset Systemic Lupus Erythematosus in Women. Front Immunol. 2016. 7:103. [Medline]. [Full Text]. Lehmann P, Hölzle E, Kind P, Goerz G, Plewig G. Experimental reproduction of skin lesions in lupus erythematosus by UVA and UVB radiation. J Am Acad Dermatol. 1990 Feb. 22(2 Pt 1):181-7. [Medline]. Buyon JP, Kim MY, Salmon JE. Predictors of Pregnancy Outcomes in Patients With Lupus. Ann Intern Med. 2016 Jan 19. 164 (2):131. [Medline]. Gatenby P, Lucas R, Swaminathan A. Vitamin D deficiency and risk for rheumatic diseases: an update. Curr Opin Rheumatol. 2013 Mar. 25 (2):184-91. [Medline]. Ritterhouse LL, Crowe SR, Niewold TB, et al. Vitamin D deficiency is associated with an increased autoimmune response in healthy individuals and in patients with systemic lupus erythematosus. Ann Rheum Dis. 2011 Sep. 70(9):1569-74. [Medline]. [Full Text]. Young KA, Munroe ME, Guthridge JM, Kamen DL, Niewold TB, Gilkeson GS, et al. Combined role of vitamin D status and CYP24A1 in the transition to systemic lupus erythematosus. Ann Rheum Dis. 2016 Jun 9. [Medline]. Hu W, Niu G, Lin Y, Chen X, Lin L. Impact of the polymorphism in vitamin D receptor gene BsmI and the risk of systemic lupus erythematosus: an updated meta-analysis. Clin Rheumatol. 2016 Apr. 35 (4):927-34. [Medline]. Jarukitsopa S, Hoganson DD, Crowson CS, Sokumbi O, Davis MD, Michet CJ Jr, et al. Epidemiology of systemic lupus erythematosus and cutaneous lupus erythematosus in a predominantly white population in the United States. Arthritis Care Res (Hoboken). 2015 May. 67 (6):817-28. [Medline]. [Full Text]. Lupus Foundation of America. What is lupus. Available at http://www.lupus.org/webmodules/webarticlesnet/templates/new_learnunderstanding.aspx?articleid=2232&zoneid=523. 2015; Accessed: September 25, 2015. Helmick CG, Felson DT, Lawrence RC, Gabriel S, Hirsch R, Kwoh CK, et al. Estimates of the prevalence of arthritis and other rheumatic conditions in the United States. Part I. Arthritis Rheum. 2008 Jan. 58(1):15-25. [Medline]. Somers EC, Marder W, Cagnoli P, Lewis EE, DeGuire P, Gordon C, et al. Population-based incidence and prevalence of systemic lupus erythematosus: the Michigan Lupus Epidemiology and Surveillance program. Arthritis Rheumatol. 2014 Feb. 66 (2):369-78. [Medline]. [Full Text]. Centers for Disease Control and Prevention. Systemic lupus erythematosus (SLE). Available at http://www.cdc.gov/arthritis/basics/lupus.htm/#2. July 23, 2015; Accessed: August 15, 2016. Balluz L, Philen R, Ortega L, Rosales C, Brock J, Barr D, et al. Investigation of systemic lupus erythematosus in Nogales, Arizona. Am J Epidemiol. 2001 Dec 1. 154(11):1029-36. [Medline]. Uramoto KM, Michet CJ Jr, Thumboo J, Sunku J, O'Fallon WM, Gabriel SE. Trends in the incidence and mortality of systemic lupus erythematosus, 1950-1992. Arthritis Rheum. 1999 Jan. 42(1):46-50. [Medline]. Danchenko N, Satia JA, Anthony MS. Epidemiology of systemic lupus erythematosus: a comparison of worldwide disease burden. Lupus. 2006. 15(5):308-18. [Medline]. Symmons DP. Frequency of lupus in people of African origin. Lupus. 1995 Jun. 4(3):176-8. [Medline]. Jakes RW, Bae SC, Louthrenoo W, Mok CC, Navarra SV, Kwon N. Systematic review of the epidemiology of systemic lupus erythematosus in the Asia-Pacific region: prevalence, incidence, clinical features, and mortality. Arthritis Care Res (Hoboken). 2012 Feb. 64(2):159-68. [Medline]. Ginzler E, Tayar J. Lupus. American College of Rheumatology. Available at http://www.rheumatology.org/practice/clinical/patients/diseases_and_conditions/lupus.pdf#search=sle. June 2015; Accessed: September 25, 2015. Costenbader KH, Feskanich D, Stampfer MJ, Karlson EW. Reproductive and menopausal factors and risk of systemic lupus erythematosus in women. Arthritis Rheum. 2007 Apr. 56(4):1251-62. [Medline]. Dillon S, Aggarwal R, Harding JW, et al. Klinefelter's syndrome (47,XXY) among men with systemic lupus erythematosus. Acta Paediatr. 2011 Jun. 100(6):819-23. [Medline]. Manzi S. Epidemiology of systemic lupus erythematosus. Am J Manag Care. 2001 Oct. 7(16 Suppl):S474-9. [Medline]. Klein-Gitelman M, Reiff A, Silverman ED. Systemic lupus erythematosus in childhood. Rheum Dis Clin North Am. 2002 Aug. 28(3):561-77, vi-vii. [Medline]. Pineles D, Valente A, Warren B, Peterson MG, Lehman TJ, Moorthy LN. Worldwide incidence and prevalence of pediatric onset systemic lupus erythematosus. Lupus. 2011 Oct. 20(11):1187-92. [Medline]. Boddaert J, Huong DL, Amoura Z, Wechsler B, Godeau P, Piette JC. Late-onset systemic lupus erythematosus: a personal series of 47 patients and pooled analysis of 714 cases in the literature. Medicine (Baltimore). 2004 Nov. 83(6):348-59. [Medline]. Faurschou M, Dreyer L, Kamper AL, Starklint H, Jacobsen S. Long-term mortality and renal outcome in a cohort of 100 patients with lupus nephritis. Arthritis Care Res (Hoboken). 2010 Jun. 62(6):873-80. [Medline]. Kasitanon N, Magder LS, Petri M. Predictors of survival in systemic lupus erythematosus. Medicine (Baltimore). 2006 May. 85(3):147-56. [Medline]. Urowitz MB, Gladman DD, Ibañez D, et al. Evolution of disease burden over five years in a multicenter inception systemic lupus erythematosus cohort. Arthritis Care Res (Hoboken). 2012 Jan. 64(1):132-7. [Medline]. Bertsias G, Ioannidis JP, Boletis J, et al. EULAR recommendations for the management of systemic lupus erythematosus. Report of a Task Force of the EULAR Standing Committee for International Clinical Studies Including Therapeutics. Ann Rheum Dis. 2008 Feb. 67(2):195-205. [Medline]. Trager J, Ward MM. Mortality and causes of death in systemic lupus erythematosus. Curr Opin Rheumatol. 2001 Sep. 13(5):345-51. [Medline]. Abu-Shakra M, Urowitz MB, Gladman DD, Gough J. Mortality studies in systemic lupus erythematosus. Results from a single center. II. Predictor variables for mortality. J Rheumatol. 1995 Jul. 22(7):1265-70. [Medline]. Murali R, Jeyaseelan L, Rajaratnam S, John L, Ganesh A. Systemic lupus erythematosus in Indian patients: prognosis, survival and life expectancy. Natl Med J India. 1997 Jul-Aug. 10(4):159-64. [Medline]. Wang F, Wang CL, Tan CT, Manivasagar M. Systemic lupus erythematosus in Malaysia: a study of 539 patients and comparison of prevalence and disease expression in different racial and gender groups. Lupus. 1997. 6(3):248-53. [Medline]. Urowitz MB, Bookman AA, Koehler BE, Gordon DA, Smythe HA, Ogryzlo MA. The bimodal mortality pattern of systemic lupus erythematosus. Am J Med. 1976 Feb. 60(2):221-5. [Medline]. Cervera R, Khamashta MA, Font J, Sebastiani GD, Gil A, Lavilla P, et al. Morbidity and mortality in systemic lupus erythematosus during a 5-year period. A multicenter prospective study of 1,000 patients. European Working Party on Systemic Lupus Erythematosus. Medicine (Baltimore). 1999 May. 78(3):167-75. [Medline]. Manzi S, Meilahn EN, Rairie JE, Conte CG, Medsger TA Jr, Jansen-McWilliams L, et al. Age-specific incidence rates of myocardial infarction and angina in women with systemic lupus erythematosus: comparison with the Framingham Study. Am J Epidemiol. 1997 Mar 1. 145(5):408-15. [Medline]. Gladman DD, Urowitz MB. Prognosis, mortality and morbidity in systemic lupus erythematosus In: Wallace DJ, Hahn BH. Dubois’ lupus erythematosus. 7th ed. Philadelphia: Lippincott Williams & Wilkins; 2007:1333-53. Faurschou M, Mellemkjaer L, Starklint H, et al. High risk of ischemic heart disease in patients with lupus nephritis. J Rheumatol. 2011 Nov. 38(11):2400-5. [Medline]. Petri M, Spence D, Bone LR, Hochberg MC. Coronary artery disease risk factors in the Johns Hopkins Lupus Cohort: prevalence, recognition by patients, and preventive practices. Medicine (Baltimore). 1992 Sep. 71(5):291-302. [Medline]. Salmon JE, Roman MJ. Accelerated atherosclerosis in systemic lupus erythematosus: implications for patient management. Curr Opin Rheumatol. 2001 Sep. 13(5):341-4. [Medline]. Alarcón GS, McGwin G Jr, Bastian HM, Roseman J, Lisse J, Fessler BJ, et al. Systemic lupus erythematosus in three ethnic groups. VII [correction of VIII]. Predictors of early mortality in the LUMINA cohort. LUMINA Study Group. Arthritis Rheum. 2001 Apr. 45(2):191-202. [Medline]. Oinuma K, Harada Y, Nawata Y, Takabayashi K, Abe I, Kamikawa K, et al. Osteonecrosis in patients with systemic lupus erythematosus develops very early after starting high dose corticosteroid treatment. Ann Rheum Dis. 2001 Dec. 60(12):1145-8. [Medline]. [Full Text]. Gladman DD, Urowitz MB, Chaudhry-Ahluwalia V, Hallet DC, Cook RJ. Predictive factors for symptomatic osteonecrosis in patients with systemic lupus erythematosus. J Rheumatol. 2001 Apr. 28(4):761-5. [Medline]. Callen JP. Systemic lupus erythematosus in patients with chronic cutaneous (discoid) lupus erythematosus. Clinical and laboratory findings in seventeen patients. J Am Acad Dermatol. 1985 Feb. 12(2 Pt 1):278-88. [Medline]. Healy E, Kieran E, Rogers S. Cutaneous lupus erythematosus--a study of clinical and laboratory prognostic factors in 65 patients. Ir J Med Sci. 1995 Apr-Jun. 164(2):113-5. [Medline]. Wallace D, Edmund D, eds. Dubois' Lupus Erythematosus. Philadelphia, Pa: Lippincott Williams & Wilkins. ; 2006. Jennekens FG, Kater L. The central nervous system in systemic lupus erythematosus. Part 1. Clinical syndromes: a literature investigation. Rheumatology (Oxford). 2002 Jun. 41(6):605-18. [Medline]. Jennekens FG, Kater L. The central nervous system in systemic lupus erythematosus. Part 2. Pathogenetic mechanisms of clinical syndromes: a literature investigation. Rheumatology (Oxford). 2002 Jun. 41(6):619-30. [Medline]. Bertsias GK, Ioannidis JP, Aringer M, et al. EULAR recommendations for the management of systemic lupus erythematosus with neuropsychiatric manifestations: report of a task force of the EULAR standing committee for clinical affairs. Ann Rheum Dis. 2010 Dec. 69(12):2074-82. [Medline]. American College of Rheumatology. The American College of Rheumatology nomenclature and case definitions for neuropsychiatric lupus syndromes. Arthritis Rheum. 1999 Apr. 42 (4):599-608. [Medline]. Varaprasad IR, Agrawal S, Prabu VN, Rajasekhar L, Kanikannan MA, Narsimulu G. Posterior reversible encephalopathy syndrome in systemic lupus erythematosus. J Rheumatol. 2011 Aug. 38(8):1607-11. [Medline]. Petri M, Naqibuddin M, Carson KA, Wallace DJ, Weisman MH, Holliday SL, et al. Depression and cognitive impairment in newly diagnosed systemic lupus erythematosus. J Rheumatol. 2010 Oct. 37(10):2032-8. [Medline]. Messer J, Reitman D, Sacks HS, Smith H Jr, Chalmers TC. Association of adrenocorticosteroid therapy and peptic-ulcer disease. N Engl J Med. 1983 Jul 7. 309(1):21-4. [Medline]. Ramos-Casals M, Cuadrado MJ, Alba P, Sanna G, Brito-Zerón P, Bertolaccini L, et al. Acute viral infections in patients with systemic lupus erythematosus: description of 23 cases and review of the literature. Medicine (Baltimore). 2008 Nov. 87(6):311-8. [Medline]. Fessler BJ. Infectious diseases in systemic lupus erythematosus: risk factors, management and prophylaxis. Best Pract Res Clin Rheumatol. 2002 Apr. 16(2):281-91. [Medline]. Stefanidou S, Benos A, Galanopoulou V, et al. Clinical expression and morbidity of systemic lupus erythematosus during a post-diagnostic 5-year follow-up: a male:female comparison. Lupus. 2011 Oct. 20(10):1090-4. [Medline]. Muscal E, Brey RL. Neurologic manifestations of systemic lupus erythematosus in children and adults. Neurol Clin. 2010 Feb. 28(1):61-73. [Medline]. [Full Text]. Lin YC, Wang AG, Yen MY. Systemic lupus erythematosus-associated optic neuritis: clinical experience and literature review. Acta Ophthalmol. 2009 Mar. 87(2):204-10. [Medline]. Tan EM, Cohen AS, Fries JF, Masi AT, McShane DJ, Rothfield NF, et al. The 1982 revised criteria for the classification of systemic lupus erythematosus. Arthritis Rheum. 1982 Nov. 25(11):1271-7. [Medline]. Williams EL, Gadola S, Edwards CJ. Anti-TNF-induced lupus. Rheumatology (Oxford). 2009 Jul. 48(7):716-20. [Medline]. Hahn BH, McMahon MA, Wilkinson A, et al. American College of Rheumatology guidelines for screening, treatment, and management of lupus nephritis. Arthritis Care Res (Hoboken). 2012 Jun. 64(6):797-808. [Medline]. [Full Text]. Czeizel A. A case-control analysis of the teratogenic effects of co-trimoxazole. Reprod Toxicol. 1990. 4(4):305-13. [Medline]. Mavrogeni S, Bratis K, Markussis V, Spargias C, et al. The diagnostic role of cardiac magnetic resonance imaging in detecting myocardial inflammation in systemic lupus erythematosus. Differentiation from viral myocarditis. Lupus. 2013. 22(1):34-43. [Medline]. Hwang J, Kim HJ, Oh JM, et al. Outcome of reclassification of World Health Organization (WHO) class III under International Society of Nephrology-Renal Pathology Society (ISN-RPS) classification: retrospective observational study. Rheumatol Int. 2012 Jul. 32(7):1877-84. [Medline]. Mittal B, Hurwitz S, Rennke H, Singh AK. New subcategories of class IV lupus nephritis: are there clinical, histologic, and outcome differences?. Am J Kidney Dis. 2004 Dec. 44(6):1050-9. [Medline]. Weening JJ, D'Agati VD, Schwartz MM, et al. The classification of glomerulonephritis in systemic lupus erythematosus revisited. J Am Soc Nephrol. Feb 2004;15(2):241-50:[Medline]. Alarcón GS, McGwin G, Bertoli AM, Fessler BJ, Calvo-Alén J, Bastian HM, et al. Effect of hydroxychloroquine on the survival of patients with systemic lupus erythematosus: data from LUMINA, a multiethnic US cohort (LUMINA L). Ann Rheum Dis. 2007 Sep. 66(9):1168-72. [Medline]. [Full Text]. Broder A, Khattri S, Patel R, Putterman C. Undertreatment of Disease Activity in Systemic Lupus Erythematosus Patients with Endstage Renal Failure Is Associated with Increased All-cause Mortality. J Rheumatol. 2011 Nov. 38(11):2382-9. [Medline]. Mosca M, Tani C, Aringer M, et al. European League Against Rheumatism recommendations for monitoring patients with systemic lupus erythematosus in clinical practice and in observational studies. Ann Rheum Dis. 2010 Jul. 69(7):1269-74. [Medline]. [Full Text]. Yazdany J, Panopalis P, Gillis JZ, Schmajuk G, MacLean CH, Wofsy D, et al. A quality indicator set for systemic lupus erythematosus. Arthritis Rheum. 2009 Mar 15. 61(3):370-7. [Medline]. [Full Text]. Zheng ZH, Gao CC, Wu ZZ, Liu SY, Li TF, Gao GM, et al. High prevalence of hypovitaminosis D of patients with autoimmune rheumatic diseases in China. Am J Clin Exp Immunol. 2016. 5 (3):48-54. [Medline]. [Full Text]. Salman-Monte TC, Torrente-Segarra V, Almirall M, Corzo P, Mojal S, Carbonell-Abelló J. Prevalence and predictors of vitamin D insufficiency in supplemented and non-supplemented women with systemic lupus erythematosus in the Mediterranean region. Rheumatol Int. 2016 Jul. 36 (7):975-85. [Medline]. Lima GL, Paupitz J, Aikawa NE, Takayama L, Bonfa E, Pereira RM. Vitamin D Supplementation in Adolescents and Young Adults With Juvenile Systemic Lupus Erythematosus for Improvement in Disease Activity and Fatigue Scores: A Randomized, Double-Blind, Placebo-Controlled Trial. Arthritis Care Res (Hoboken). 2016 Jan. 68 (1):91-8. [Medline]. Reynolds J, Ray D, Alexander MY, Bruce I. Role of vitamin D in endothelial function and endothelial repair in clinically stable systemic lupus erythematosus. Lancet. 2015 Feb 26. 385 Suppl 1:S83. [Medline]. Kamen DL, Oates JC. A Pilot Randomized Controlled Trial of Vitamin D Repletion to Determine if Endothelial Function Improves in Patients With Systemic Lupus Erythematosus. Am J Med Sci. 2015 Sep 7. [Medline]. Reynolds JA, Haque S, Williamson K, Ray DW, Alexander MY, Bruce IN. Vitamin D improves endothelial dysfunction and restores myeloid angiogenic cell function via reduced CXCL-10 expression in systemic lupus erythematosus. Sci Rep. 2016 Mar 1. 6:22341. [Medline]. Navarra SV, Guzmán RM, Gallacher AE, Hall S, Levy RA, Jimenez RE, et al. Efficacy and safety of belimumab in patients with active systemic lupus erythematosus: a randomised, placebo-controlled, phase 3 trial. Lancet. 2011 Feb 26. 377(9767):721-31. [Medline]. Hill E. Belimumab Earns FDA Approval for Lupus. Medscape News. March 15, 2011. [Full Text]. Brooks M. FDA Clears Self-injectable Belimumab (Benlysta) for SLE. Medscape Medical News. 2017 Jul 21. Available at http://www.medscape.com/viewarticle/883270. Furie RA, Petri MA, Wallace DJ, et al. Novel evidence-based systemic lupus erythematosus responder index. Arthritis Rheum. 2009 Sep 15. 61(9):1143-51. [Medline]. [Full Text]. Furie R, Petri M, Zamani O, et al. A phase III, randomized, placebo-controlled study of belimumab, a monoclonal antibody that inhibits B lymphocyte stimulator, in patients with systemic lupus erythematosus. Arthritis Rheum. 2011 Dec. 63(12):3918-30. [Medline]. Stohl W, Schwarting A, Okada M, Scheinberg M, Doria A, Hammer AE, et al. Efficacy and Safety of Subcutaneous Belimumab in Systemic Lupus Erythematosus: A Fifty-Two-Week Randomized, Double-Blind, Placebo-Controlled Study. Arthritis Rheumatol. 2017 May. 69 (5):1016-1027. [Medline]. [Full Text]. Lu TY, Ng KP, Cambridge G, Leandro MJ, Edwards JC, Ehrenstein M, et al. A retrospective seven-year analysis of the use of B cell depletion therapy in systemic lupus erythematosus at University College London Hospital: the first fifty patients. Arthritis Rheum. 2009 Apr 15. 61(4):482-7. [Medline]. Hughes G. Rituximab in lupus and beyond: the state of the art. Lupus. 2009 Jun. 18(7):639-44. [Medline]. Murray E, Perry M. Off-label use of rituximab in systemic lupus erythematosus: a systematic review. Clin Rheumatol. 2010 Jul. 29(7):707-16. [Medline]. Terrier B, Amoura Z, Ravaud P, et al. Safety and efficacy of rituximab in systemic lupus erythematosus: results from 136 patients from the French AutoImmunity and Rituximab registry. Arthritis Rheum. 2010 Aug. 62(8):2458-66. [Medline]. Aguiar R, Araújo C, Martins-Coelho G, Isenberg D. Use of rituximab in systemic lupus erythematosus: a single center experience over 14 years. Arthritis Care Res (Hoboken). 2016 Apr 25. 10 (3):114-6. [Medline]. Merrill JT, Neuwelt CM, Wallace DJ, et al. Efficacy and safety of rituximab in moderately-to-severely active systemic lupus erythematosus: the randomized, double-blind, phase II/III systemic lupus erythematosus evaluation of rituximab trial. Arthritis Rheum. 2010 Jan. 62(1):222-33. [Medline]. Rovin BH, Furie R, Latinis K, et al. Efficacy and safety of rituximab in patients with active proliferative lupus nephritis: the Lupus Nephritis Assessment with Rituximab study. Arthritis Rheum. 2012 Apr. 64(4):1215-26. [Medline]. Murdaca G, Colombo BM, Puppo F. Emerging biological drugs: a new therapeutic approach for Systemic Lupus Erythematosus. An update upon efficacy and adverse events. Autoimmun Rev. 2011 Nov. 11(1):56-60. [Medline]. Andrade C, Mendonça T, Farinha F, Correia J, Marinho A, Almeida I, et al. Alveolar hemorrhage in systemic lupus erythematosus: a cohort review. Lupus. 2015 Sep 18. [Medline]. Pickering MC, Walport MJ. Links between complement abnormalities and systemic lupus erythematosus. Rheumatology (Oxford). 2000 Feb. 39(2):133-41. [Medline]. Ramos-Casals M, Campoamor MT, Chamorro A, et al. Hypocomplementemia in systemic lupus erythematosus and primary antiphospholipid syndrome: prevalence and clinical significance in 667 patients. Lupus. 2004. 13(10):777-83. [Medline]. Mosca M, Tani C, Carli L, Bombardieri S. Glucocorticoids in systemic lupus erythematosus. Clin Exp Rheumatol. 2011 Sep-Oct. 29(5 Suppl 68):S126-9. [Medline]. Contreras G, Pardo V, Leclercq B, Lenz O, Tozman E, O'Nan P, et al. Sequential therapies for proliferative lupus nephritis. N Engl J Med. 2004 Mar 4. 350(10):971-80. [Medline]. Ginzler EM, Dooley MA, Aranow C, et al. Mycophenolate mofetil or intravenous cyclophosphamide for lupus nephritis. N Engl J Med. 2005 Nov 24. 353(21):2219-28. [Medline]. Ginzler EM, Wofsy D, Isenberg D, Gordon C, Lisk L, Dooley MA. Nonrenal disease activity following mycophenolate mofetil or intravenous cyclophosphamide as induction treatment for lupus nephritis: findings in a multicenter, prospective, randomized, open-label, parallel-group clinical trial. Arthritis Rheum. 2010 Jan. 62(1):211-21. [Medline]. Dooley MA, Jayne D, Ginzler EM, et al. Mycophenolate versus azathioprine as maintenance therapy for lupus nephritis. N Engl J Med. 2011 Nov 17. 365(20):1886-95. [Medline]. Houssiau FA, D'Cruz D, Sangle S, et al. Azathioprine versus mycophenolate mofetil for long-term immunosuppression in lupus nephritis: results from the MAINTAIN Nephritis Trial. Ann Rheum Dis. 2010 Dec. 69(12):2083-9. [Medline]. [Full Text]. Griffiths B, Emery P, Ryan V, Isenberg D, Akil M, Thompson R, et al. The BILAG multi-centre open randomized controlled trial comparing ciclosporin vs azathioprine in patients with severe SLE. Rheumatology (Oxford). 2010 Apr. 49(4):723-32. [Medline]. Bramham K, Hunt BJ, Bewley S, et al. Pregnancy outcomes in systemic lupus erythematosus with and without previous nephritis. J Rheumatol. 2011 Sep. 38(9):1906-13. [Medline]. Long AA, Ginsberg JS, Brill-Edwards P, et al. The relationship of antiphospholipid antibodies to thromboembolic disease in systemic lupus erythematosus: a cross-sectional study. Thromb Haemost. 1991 Nov 1. 66(5):520-4. [Medline]. Ruiz-Irastorza G, Khamashta MA. Pregnancy and rheumatic disease. Reviewed: February 2012. Available at http://www.rheumatology.org/practice/clinical/patients/diseases_and_conditions/pregnancy.asp. Accessed: March 15, 2012. Vinet E, Clarke AE, Gordon C, Urowitz MB, Hanly JG, Pineau CA, et al. Decreased live births in women with systemic lupus erythematosus. Arthritis Care Res (Hoboken). 2011 Jul. 63(7):1068-72. [Medline]. Silverman E, Jaeggi E. Non-cardiac manifestations of neonatal lupus erythematosus. Scand J Immunol. 2010 Sep. 72(3):223-5. [Medline]. Hornberger LK, Al Rajaa N. Spectrum of cardiac involvement in neonatal lupus. Scand J Immunol. 2010 Sep. 72(3):189-97. [Medline]. Jaeggi E, Laskin C, Hamilton R, Kingdom J, Silverman E. The importance of the level of maternal anti-Ro/SSA antibodies as a prognostic marker of the development of cardiac neonatal lupus erythematosus a prospective study of 186 antibody-exposed fetuses and infants. J Am Coll Cardiol. 2010 Jun 15. 55(24):2778-84. [Medline]. Petri M, Kim MY, Kalunian KC, Grossman J, Hahn BH, Sammaritano LR, et al. Combined oral contraceptives in women with systemic lupus erythematosus. N Engl J Med. 2005 Dec 15. 353(24):2550-8. [Medline]. Schmajuk G, Yelin E, Chakravarty E, Nelson LM, Panopolis P, Yazdany J. Osteoporosis screening, prevention, and treatment in systemic lupus erythematosus: application of the systemic lupus erythematosus quality indicators. Arthritis Care Res (Hoboken). 2010 Jul. 62(7):993-1001. [Medline]. [Full Text]. Schmajuk G, Schneeweiss S, Katz JN, et al. Treatment of older adult patients diagnosed with rheumatoid arthritis: improved but not optimal. Arthritis Rheum. 2007 Aug 15. 57(6):928-34. [Medline]. Wajed J, Ahmad Y, Durrington PN, Bruce IN. Prevention of cardiovascular disease in systemic lupus erythematosus--proposed guidelines for risk factor management. Rheumatology (Oxford). 2004 Jan. 43(1):7-12. [Medline]. Scalzi LV, Hollenbeak CS, Wang L. Racial disparities in age at time of cardiovascular events and cardiovascular-related death in patients with systemic lupus erythematosus. Arthritis Rheum. 2010 Sep. 62(9):2767-75. [Medline]. [Full Text]. van Assen S, Agmon-Levin N, Elkayam O, Cervera R, Doran MF, Dougados M, et al. EULAR recommendations for vaccination in adult patients with autoimmune inflammatory rheumatic diseases. Ann Rheum Dis. 2011 Mar. 70(3):414-22. [Medline]. Ibañez D, Gladman DD, Touma Z, Nikpour M, Urowitz MB. Optimal frequency of visits for patients with systemic lupus erythematosus to measure disease activity over time. J Rheumatol. 2011 Jan. 38(1):60-3. [Medline]. Yap KS, Northcott M, Hoi AB, Morand EF, Nikpour M. Association of low vitamin D with high disease activity in an Australian systemic lupus erythematosus cohort. Lupus Sci Med. 2015. 2 (1):e000064. [Medline]. García-Carrasco M, Mendoza-Pinto C, Etchegaray-Morales I, Soto-Santillán P, Jiménez-Herrera EA, Robles-Sánchez V, et al. Vitamin D insufficiency and deficiency in mexican patients with systemic lupus erythematosus: Prevalence and relationship with disease activity. Reumatol Clin. 2016 Apr 12. [Medline]. Lin TC, Wu JY, Kuo ML, Ou LS, Yeh KW, Huang JL. Correlation between disease activity of pediatric-onset systemic lupus erythematosus and level of vitamin D in Taiwan: A case-cohort study. J Microbiol Immunol Infect. 2016 Jan 12. [Medline]. Schoindre Y, et al; Group PLUS. Lower vitamin D levels are associated with higher systemic lupus erythematosus activity, but not predictive of disease flare-up. Lupus Sci Med. 2014. 1 (1):e000027. [Medline]. [Full Text]. Cannon M. Azathioprine (Imuran). Updated: June 2009. Available at http://www.rheumatology.org/practice/clinical/patients/medications/azathioprine.pdf#search=sle. Accessed: March 15, 2012. Boumpas DT, Austin HA 3rd, Vaughn EM, Klippel JH, Steinberg AD, Yarboro CH, et al. Controlled trial of pulse methylprednisolone versus two regimens of pulse cyclophosphamide in severe lupus nephritis. Lancet. 1992 Sep 26. 340(8822):741-5. [Medline]. Houssiau FA, Vasconcelos C, D'Cruz D, et al. The 10-year follow-up data of the Euro-Lupus Nephritis Trial comparing low-dose and high-dose intravenous cyclophosphamide. Ann Rheum Dis. 2010 Jan. 69(1):61-4. [Medline]. Ginzler EM, Dooley MA, Aranow C, Kim MY, Buyon J, Merrill JT, et al. Mycophenolate mofetil or intravenous cyclophosphamide for lupus nephritis. N Engl J Med. 2005 Nov 24. 353(21):2219-28. [Medline]. Appel GB, Contreras G, Dooley MA, et al. Mycophenolate mofetil versus cyclophosphamide for induction treatment of lupus nephritis. J Am Soc Nephrol. 2009 May. 20(5):1103-12. [Medline]. [Full Text]. Isenberg D, Appel GB, Contreras G, et al. Influence of race/ethnicity on response to lupus nephritis treatment: the ALMS study. Rheumatology (Oxford). 2010 Jan. 49(1):128-40. [Medline]. [Full Text]. Dermatomyositis. Acute onset of confluent macular erythema in a periorbital and malar distribution (involving the cheeks and extending over the nasal bridge), with extension to the chin in a female with juvenile dermatomyositis. Note the perioral sparing. In some patients, there may be more extensive involvement of the face, including the perioral region, forehead, lateral face, and ears. In contrast to SLE , in dermatomyositis with malar erythema, the nasolabial folds are often not spared. Photosensitive systemic lupus erythematosus (SLE) rashes typically occur on the face or extremities, which are sun-exposed regions. Although the interphalangeal spaces are affected, the metacarpophalangeal (MCP) and proximal interphalangeal (PIP) and distal interphalangeal (DIP) joints are spared. Photo courtesy of Dr. Erik Stratman, Marshfield Clinic. In systemic lupus erythematosus (SLE), many genetic-susceptibility factors, environmental triggers, antigen-antibody (Ab) responses, B-cell and T-cell interactions, and immune clearance processes interact to generate and perpetuate autoimmunity. HLA = human leukocyte antigen; UV = ultraviolet light. SLE can be diagnosed if any 4 or more of the following 11 criteria are present, serially or simultaneously, during any interval of observation. ECG = electrocardiogram; Ig = immunoglobulin; SLE = systemic lupus erythematosus. Disclosure: Received research grant from: Independent Grants for Learning and Change (Pfizer). The authors would like to thank Joanna Wong for assistance in preparation of revisions to this topic.